Things would seem to be going well at Electronic Arts (EA). Madden NFL 13 sold 9% more copies than Madden NFL 12 last year. FIFA 13 and Battlefield 3 are shaping up to be "the two biggest revenue events" in EA's history, according to its CEO. Digital revenue is up 40%. The Simpsons: Tapped Out has been one of mobile's highest-grossing games in recent weeks, attracting as many as 2.8 million daily active users. The video game developer and publisher offered up better-than-expected quarterly results on Tuesday night. However, revenue wouldn't be down slightly over the past year -- or up just 4% on an adjusted basis -- if things were going swimmingly well. The die-hard gamer fave wouldn't be revising its top- and bottom-line guidance slightly lower for all of fiscal 2013 if the near-term outlook wasn't problematic. EA was bragging on Tuesday about beating its guidance for 11 consecutive quarters, but is the streak so noble when it's putting out disappointing estimates for the current quarter? There are now 42 million monthly active players of its social games. A year ago it was 101 million users. EA Origin -- its platform for digital game downloads and services -- has more than 30 million registered users and more than 70 third-party developers on board. That's great, but why have only 4.4 million of those users actually bought something on the platform? After a nine-figure investment, Star Wars: The Old Republic is fading fast. The subscription-based fantasy game had more than 1.5 million players shortly after it launched late last year, but it's at fewer than a million players today. EA is planning to introduce a "free-to-play" version in November in what may be a last-ditch effort to make it work. Earlier this year, EA was set to roll out 41 mobile titles. Somewhat inexplicably, that target has been quietly whittled down to just 31 releases. 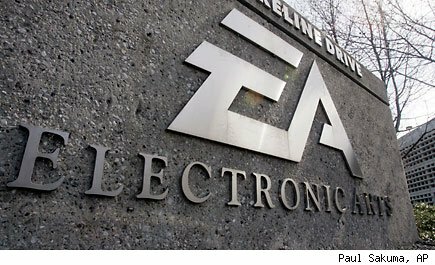 Maybe there's a reason Consumerist.com readers voted EA the worst company in the country earlier this year. Keep in mind that EA had to beat out Sony (SNE), Best Buy (BBY), and Comcast (CMCSA) in heated rounds before dethroning Bank of America (BAC) at the final. You have to be pretty bad to stink in the eyes of the masses against those companies. At the time, voters were simply upset with EA's penchant for squeezing the life out of small developers it acquires and the way it was wedging micro-transactions into so many of its games. That hasn't changed. If anything, it's gotten worse. The reason FIFA 3 and Battlefield 3 are being tagged as potential billion-dollar-a-year franchises is that physical sales are being enhanced by the digital sales that weren't there before. No one is going to argue that digital isn't the future. The packaged-goods format is fading, and investors in EA have far less to worry about than GameStop (GME) shareholders. EA creates the content. Save for the EA Sports-related licenses, it owns the content. However, EA also has its risks. Sure, the company trades at a low earnings multiple with a strong net cash position to boot. This won't matter as the playing field in gaming continues to gravitate toward smaller screens where the playing field is level. The siren song of digital is tempting at first. Reaching players directly through downloads is the golden ticket to chunky margins. Unfortunately, everybody has the same idea. EA may only have to compete with a couple of publishers on the racks of GameStop and Best Buy, but there are hundreds of thousands of apps competing for attention on the iOS and Android marketplaces. If you don't see the problem, pull up a chart for Zynga (ZNGA). The leader in social gaming has been a disaster since going public late last year. The players are there, but they're not spending $50 or $60 on a game anymore. The players are there, but so are the developers. EA is a great name with great brands, but its future seems too competitive and not as lucrative as the past. Motley Fool contributor Rick Munarriz does not own shares in any stocks in this article. The Motley Fool owns shares of Best Buy, GameStop, and Bank of America, and has sold shares of Sony short. Motley Fool newsletter services have recommended creating a written puts position in GameStop.